This is a question we’re often asked shortly after the NIGMS Advisory Council meets in January, May and September. The short answer is: No. Here’s why. As described in a previous post, our Council provides a second level of peer review of applications assigned to NIGMS. It is not a second study section. Instead, the Council provides oversight to ensure that the initial review for scientific and technical merit conducted by the study section was fair and in compliance with policy. There was appropriate expertise to review the application. The summary statement comments are substantive, appropriate and consistent with the priority score. The budget is suitable for the proposed work. The project addresses NIGMS programmatic needs. Most applications pass through this second level of review without specific comment. However, Council members occasionally identify an application that they wish to bring to the attention of program staff. This is usually due to a situation in which the numerical score is better or worse than appears to be justified by the written critique. Applications identified by Council are briefly discussed in a closed session along with applications that regularly receive additional scrutiny, such as program project grants, appeals, applications from foreign institutions, MERIT awards and applications from well-funded investigators. During each meeting, Council members review more than 1,000 applications. While they do not discuss the vast majority of them, they must vote whether to concur with the study section recommendations. For most applications, this is done en bloc. Like study sections members, Council members give expert advice about the merit of an application, but they do not make funding decisions. Deliberations about which applications to fund occur at post-Council “paylist” meetings in which groups of NIGMS program staff discuss individual applications. The scientific reviews weigh heavily in the funding decision process, but the staff also consider programmatic priorities, research portfolio balance and other factors. Once funding decisions have been made, it takes at least 2 to 3 weeks for a paylist to be generated and approved. At that point your program director will be able to tell you whether your application will be funded and if so, what the budget and term will be. If you have questions about the status of your application, your program director is the best source of information. We’re recruiting for a program director (also known as a “health scientist administrator/program officer”) to manage research grants and other types of awards in the Division of Biomedical Technology, Bioinformatics and Computational Biology. Candidates should have research experience in more than one of the following areas: computational biology, computer science, informatics, genomics data, data analytics, data integration. Excellent oral and written communication skills are required, as well as the ability to integrate a formal area of expertise with other scientific fields. More information about what a program director does, the position requirements and detailed application procedures are on the NIH HSA Web site. This is a global recruitment for program officer positions throughout NIH, so your application materials should emphasize aspects of your training, expertise and research interests that are relevant to this position. Each publication, press release, or other document about research supported by an NIH award must include an acknowledgment of NIH award support and a disclaimer such as “Research reported in this publication was supported by the National Institute of General Medical Sciences of the National Institutes of Health under award number R01GM085232. The content is solely the responsibility of the authors and does not necessarily represent the official views of the National Institutes of Health.” Prior to issuing a press release concerning the outcome of this research, please notify the NIH awarding IC in advance to allow for coordination. A key difference in the new version is the reference to “of the National Institutes of Health” after the name of the funding component. The goal is to make it clear that the funding component is part of NIH and, more broadly, to convey the role and value of NIH support. As always, we recommend that if you have more than one grant, you only cite the one(s) that supported the research described in the document. For some time now, notices of award have also mentioned the NIH public access policy, which requires you to submit papers accepted for publication to NIH PubMed Central. For more on communicating about your research, see an April 2012 Rock Talk blog post by NIH’s Sally Rockey and our Attribution of NIH/NIGMS Support page. Last week, the Advisory Committee to the Director (ACD) of NIH released two reports that are very relevant to the NIGMS missions of supporting research training and promoting a diverse biomedical workforce. The reports, produced by working groups with impressive membership rosters, have many elements in common with our training strategic plan. For example, the report from the Biomedical Research Workforce Working Group suggests that institutions provide graduate students with experiences to better prepare them for various career options, recommends testing ways to shorten the Ph.D. training period, and calls for individual development plans for postdocs regardless of the NIH grant mechanism that supports them. The report from the Working Group on Diversity in the Biomedical Research Workforce affirms the importance of a diverse biomedical workforce and NIH’s role in helping to achieve it. NIH’s Sally Rockey, who co-chaired one of the working groups, has a blog post on these ACD reports, plus an additional report on large biomedical research datasets. We look forward to working with other parts of NIH to advance our shared commitment to training and diversity. There has been considerable discussion on Sally Rockey’s Rock Talk blog and elsewhere about NIH’s pilot advisory council review of applications from investigators who have received more than $1.5 million in NIH research project grant support. As you may know, NIGMS has a longstanding policy of advisory council review of well-funded laboratories, but it differs from the NIH policy in several respects. At its May meeting, the NIGMS Advisory Council voted to continue our existing policy, which sets the threshold for special review at $750,000 in direct costs for all support. The chart below outlines some of the differences between the NIH and NIGMS policies. The NIH Biographical Sketch is a standardized format used to present professional information in grant applications. It includes sections for a personal statement, positions and honors, selected peer-reviewed publications, and a list of current and prior research support. To explore whether the format could be modified to better present an individual’s scientific abilities and accomplishments, NIH formed a working group that has just issued a request for information seeking input from the scientific community. The deadline for responses is June 29, 2012. A national effort called PULSE (Partnership for Undergraduate Life Science Education) is under way to transform undergraduate biology education at the departmental level. 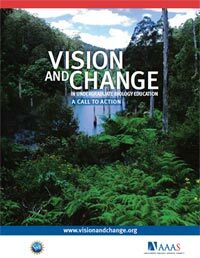 Along with the National Science Foundation and the Howard Hughes Medical Institute, we will select 40 “Vision and Change Leadership Fellows” to devise prototypic solutions that facilitate the systemic changes outlined in Vision and Change in Undergraduate Biology Education: A Call to Action . These efforts will inform future investments by NSF, HHMI and NIGMS. Awareness of the history and current thinking about undergraduate life science education reform. Undergraduate teaching experience as well as experience mentoring, motivating and evaluating other faculty. Active involvement in cultivating the mix of scholarship in teaching and life science research at their type of institution. Proposing thoughtful and creative approaches to implementing recommendations of the Vision and Change report. Engaging in open exchange and assessment of ideas. If you’re interested in applying, go to http://PULSEcommunity.org for complete details, including a video, sample application, FAQs and more. The application deadline is July 9, 2012. For more information, e-mail me or Shiva Singh, in the Training, Workforce Development and Diversity Division. Last September, I posted our funding allocation for research project grants (RPGs) in Fiscal Year 2012. I noted our strong commitment to RPGs—the vast majority of which are investigator-initiated R01 grants—and showed that we expected to spend 67% of our budget on them. I want to update you on our Fiscal Year 2012 budget, which now includes programs transferred from the former National Center for Research Resources (NCRR), and offer some historical perspective on our RPG funding. 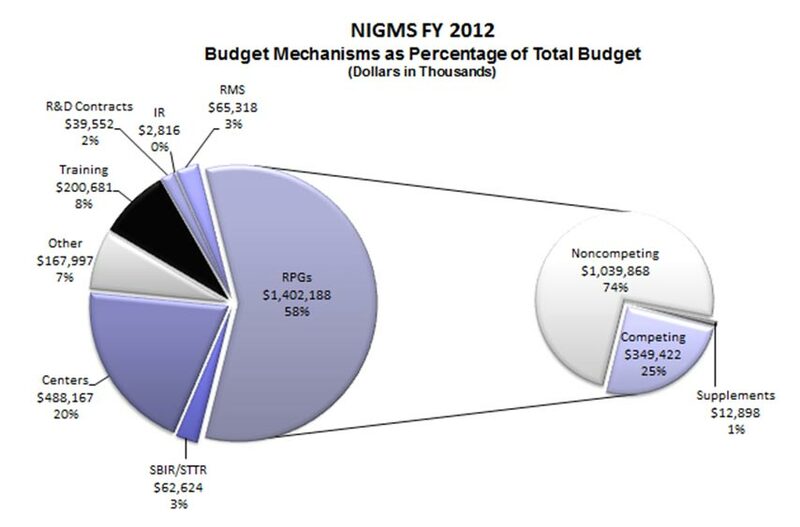 Figure 1 shows the amount NIGMS spent on RPGs compared to the total budget from 1998 to the present. From 2003 through 2011, the total RPG budget increased nearly every year, but not at a pace sufficient to maintain the same number of grants. Nevertheless, we expect to fund 184 more RPGs in Fiscal Year 2012 than we did in Fiscal Year 1998. Figure 1. 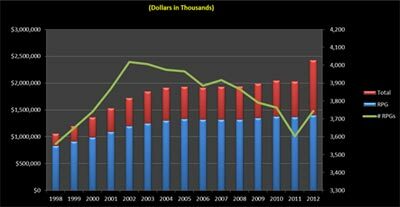 Comparison of research project grant (RPG) budgets in Fiscal Years 1998-2012, compared to the total NIGMS budget. 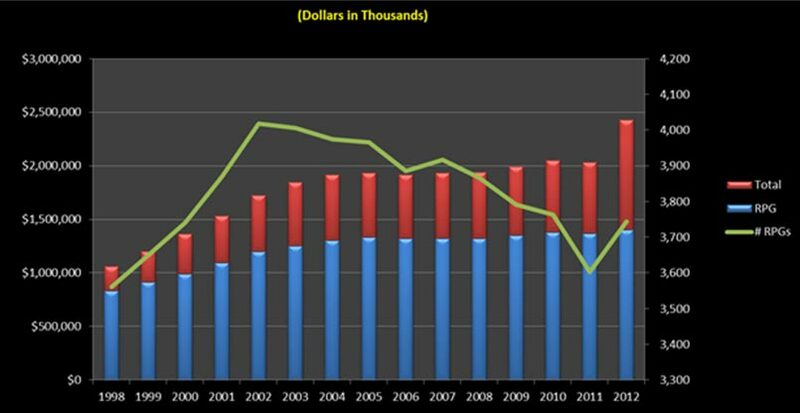 The increase in the total budget for Fiscal Year 2012 reflects the transferred NCRR programs, many of which are centers. During the 1998-2003 budget doubling period, the proportion of centers rose from 0.6% to 8.6% and remained at about 8% through Fiscal Year 2011. These centers enabled NIGMS to address important scientific opportunities and enhance the basic science infrastructure. Following the transfer of the NCRR programs, 58% of our budget will support RPGs and 20% will support centers, as shown in Figure 2. Despite the percentage shift, the amount of money spent on RPGs is comparable to that in recent fiscal years, and maintaining RPGs and investigator-initiated R01s will remain our focus. Figure 2. Fiscal Year 2012 breakdown of the NIGMS budget into its major components. About 58% of the budget will support RPGs and about 20% will support centers.